Arrangements for AquaMarine’s Day Dive Trips. Pick up times, travel times, equipment provided, what to bring & add-ons for 1 Day Bali Dive Trips. The following information applies to all 1 Day SCUBA Diving Trips on this page. Bali Diving Prices for each of our Day Trips are listed on the individual page for the dive area or Special Day Trip. Note that limited space on a limited number of Discounted 1 Day Bali Diving Trips at lower prices are available. These Discount Bali Dive Trips operate on a fixed schedule year round at reduced prices. Book now to secure your space. You may want to add additional price items to your 1 Day Dive Trip. 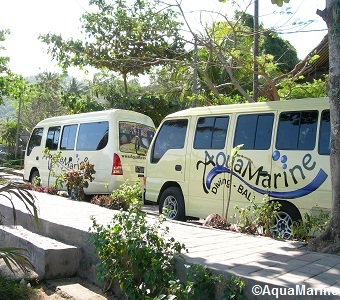 AquaMarine will pick you up at your hotel/villa for transfer to the dive site. We have 7 large Isuzu Elf minibuses that have been custom-designed to provide maximum leg room. Each minibus only carries a maximum of six guests (other companies carry 12 in the same space). In Mola-Mola season (July-mid November), AMD-B will advise you of your amended pick up time. Travel times are one-way based on pick up in south Bali.